We see what happened in the Women’s Elimination Chamber as well as in the match between Asuka and Nia Jax from last night. Alexa says it was an historic moment. When you thought it was impossible, she amazes herself. You do not know how amazing it was to retain her title in the first ever Women’s Elimination Chamber Match. She defied the odds and set the standard for being the Women’s Champion. They will talk about her victories for the next ten, twenty, or fifty years. They will say that February 25, 2018 was when she changed the game then, now, and forever. Sasha Banks and Bayley. When it comes to Bayley, she had some harsh words and she doesn’t want to be that person, but she will say it. Bayley is a sad situation. Alexa says she took advantage of Sasha’s biggest asset, her ego and she beat The Boss. Alexa says that is why she is going to Wrestlemania as she points at the sign and says it feels good to do it. She will feel as good at Wrestlemania when she breaks Asuka’s streak. Alexa reminds us that Nia got her hands on Asuka. Alexa says she cannot wait to finish the job that Nia started at Wrestlemania. Alexa points out that Asuka is acting like she is 100% healthy, but that is not true because Nia crushed her. Alexa says she wished that Nia won so she could be in the Women’s Title Match like she deserves to be. One tiny mishap and she loses. 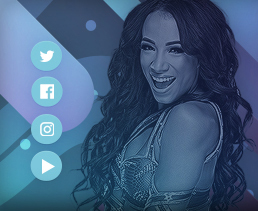 Nia deserves to be in the title match. Alexa speaks slowly so Asuka can understand. Alexa tells Asuka to wipe that smile off her face before she does. Nia Jax’ music plays and she makes her way to the ring. Alexa picks up Sasha and brings her into the ring for a near fall. Alexa slams Sasha’s head into the mat and Alexa stomps on the back of Sasha’s neck. Alexa with a reverse chin lock. Alexa with a knee and she sends Sasha into the ropes. Alexa with kicks and Sasha falls to the floor. Raw Women’s champion Alexa Bliss defending against Bayley, Sasha Banks, Mickie James, Mandy Rose and Sonya Deville in the first-ever Women’s Elimination Chamber match. We will update when a new competitor is released from a pod. They announced a competitor would be released every five minutes. The first two competitors in the Chamber are Sonya Deville and Bayley. Nice chant for Bayley at the bell. Deville took her down and grabbed a front facelock. Bayley used a leg takedown to escape and they faced off. Bayley tried to send her into the buckles face-first, but Deville blocked. She took over with some strikes to the mid-section. Deville tried to hit a catapult into the Chamber, but Bayley caught onto the chains and climbed up. Deville pulled her down and they battled. Bayley tried to send her into the steel, but Deville blocked. They battled until Deville was whipped into the cage. They battled back into the ring, where Deville was elevated into the buckles and covered for a two count. Bayley climbed to the top for her flying elbow, but Deville rolled out of the ring to the steel outside. Bayley instead nailed the elbow to the outside. The next competitor released is Mandy Rose. Mandy was kicked as she tried to enter the ring. 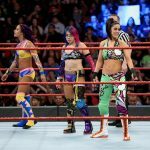 Bayley maintained control on both members of Absolution. The crowd chanted for her, but she was quickly overwhelmed. Bayley was speared on the Chamber floor and then sent several times into the cage. Absolution continued to work her over. 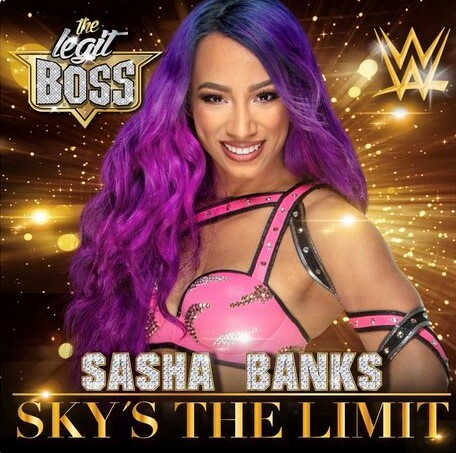 The four competitor released is Sasha Banks. Banks attacked Mandy and sent her into a pod several times. Deville grabbed Banks and muscled her away from Rose only to be beaten with right hands and a knee strike. Banks tossed her back into the ring and nailed a double knee strike for a two count. Banks worked over Deville in the corner and set her up for the double knees to the mid-section. Rose tried to intercede but was sent into the buckles. Sasha drilled Deville with the knees for another near fall. Bayley and Sasha double-teamed Deville, sending her into the Chamber wall and floor. They dumped her back into the ring, but Rose jumped them. Rose tossed Banks back into the ring and nailed a clothesine. Rose missed a knee strike and was grabbed and locked into the Bank Statement. Deville tried to make the save but was tackled by Bayley. Rose had no choice but to tap. They showed lots of close-ups of a concerned Alexa Bliss. Mickie James is the next competitor released. James cleaned house on everyone in the ring. James nailed a double clothesline on Banks and Bayley, then hit a big kick on Deville. James nailed a flapjack on Banks. She nailed a rana on the outside off the cage on Deville. Mickie began climbing the cage. Banks tried to stop her but was nailed with a superkick. James began climbing again with Bayley following her. They battled, and Bayley was kicked off the Chamber wall to the structure’s floor. James climbed atop one of the pods and hit a Thesz Press off it onto Deville, pinning her. Banks nailed a backstabber. Bayley nailed the Bayley to Belly suplex and pinned Mickie. 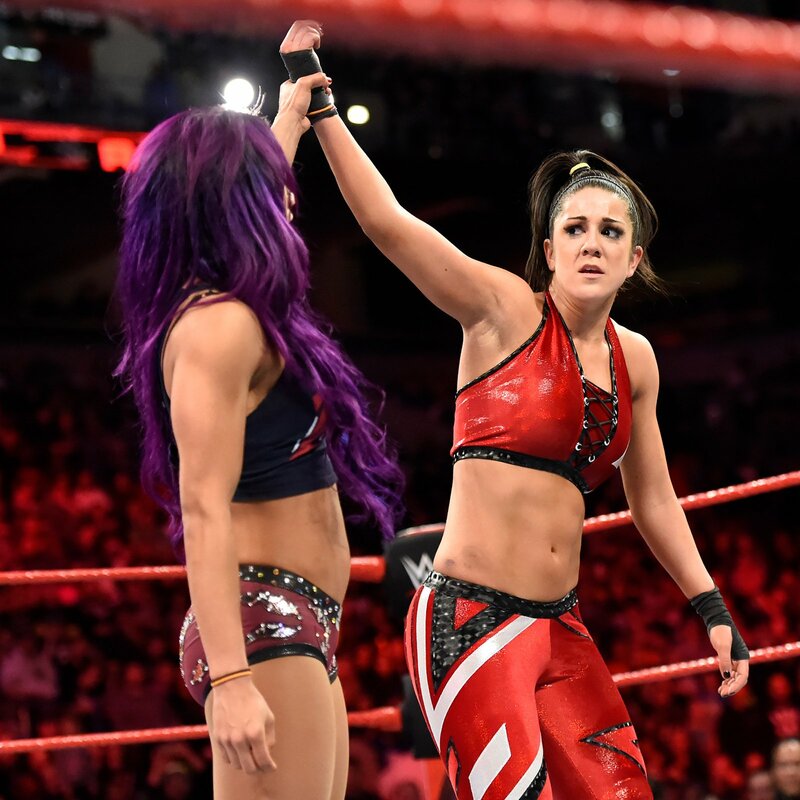 The story, as they recovered, was whether Bayley and Banks would be on the same page or face off. Banks told Bayley they would team against Bliss, who was waiting for her pod to open. The crowd counted down as it was time for her to be released. Bliss held her pod closed as they tried to get to her, then scrambled out the other side and up to the top of the pod. Bayley and Banks climbed up and she was trapped between them. Realizing this, she climbed down and when they climbed down, she went back up, a total game of cat and mouse. They finally caught her atop onto of the pods. Sasha nailed Bliss, then went to help Bayley up, only to instead kick her down to the Chamber flood. Banks stalked Bliss but Bayley attacked her. Bliss attacked Bayley and went for a quick cover, but she kicked up. Bliss choked Bayley against the ropes and stomped away at her. Bayley came back with a back suplex out of desperation. Sasha attacked Bayley and drove her onto the buckles. Bayley was able to place her in tree of woe and kicked away at her, showing some real intensity. Bayley climbed to the top, but Bliss attacked her. They battled as Sasha was in the tree of woe. Bliss nailed a superplex and they sailed into the ring over Banks. Banks pulled herself to the top and nailed a frog splash on Bayley for a close two count. The battle continued. Bayley nailed a Bayley to Belly superplex on Banks, but Bliss rolled her up and scored the pin. We are down to Banks vs. Bliss. Bliss covered her but was unable to attain the pinfall. Bliss went for the Sparkle Splash, but Banks pulled her knees up. Banks fired back and nailed a series of knees against the Chamber wall. Banks missed one and her leg got caught up in the chains. Bliss grabbed her hair and snapped her neck across the back of her knee. Bliss went to the top of the pod for Twisted Bliss, but Banks reversed it into a Bank Statement. They were on the outside, so Banks pulled her into the ring. She locked the submission on again, but Bliss was able to get to her feet and drove Sasha backwards into the corner. Banks tried to climb up in the corner but was driven into a pod face-first. Bliss drilled Banks into the mat face-first and scored the pin. Your winner and still WWE Raw Women’s champion Alexa Bliss!